To stave off disruption, savvy CIOs know they need to move at one speed: Fast. Bimodal is not an option. The proliferation of digital technologies is forcing CIOs to manage IT as a product rather than simply provide IT services. That shift requires a different mindset and work approach. Agile and DevOps are increasingly becoming the go-to software development strategies as companies overhaul their IT operating models for the digital era. 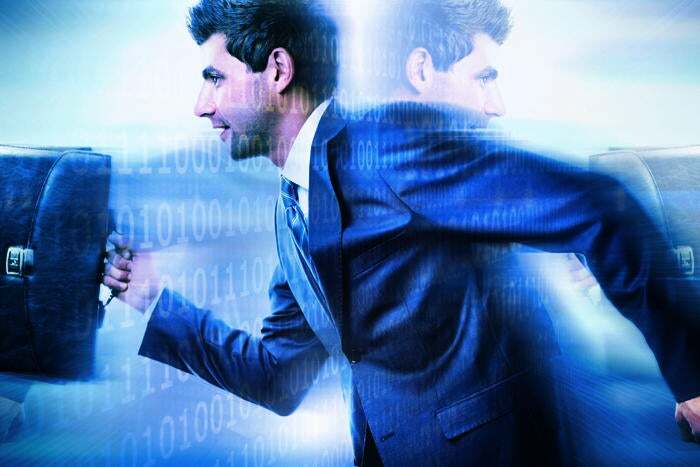 And while some CIOs can afford the luxury of operating IT in two speeds, others say there is no place for bimodal in their businesses. “I think over the last 15 years I have seen the shift where now the responsibilities of IT are product,” says Trevor Schulze, CIO of chipmaker Micron Technology, during a panel discussion at the Forbes CIO Summit last week. “If you’re asked to run revenue and you’re asked to deliver something to a customer that has a check associated with it your whole mindset has to change." Schulze offered the following kicker to his commentary: "I don’t believe in this bimodal crap – let’s get past that." Popularized by Gartner in 2014, bimodal IT is two-speed approach that emphasizes conducting stable IT development for projects (ERP, for example) concurrently with faster-paced and agile experiments in digital services (chatbots or voice recognition, for example). 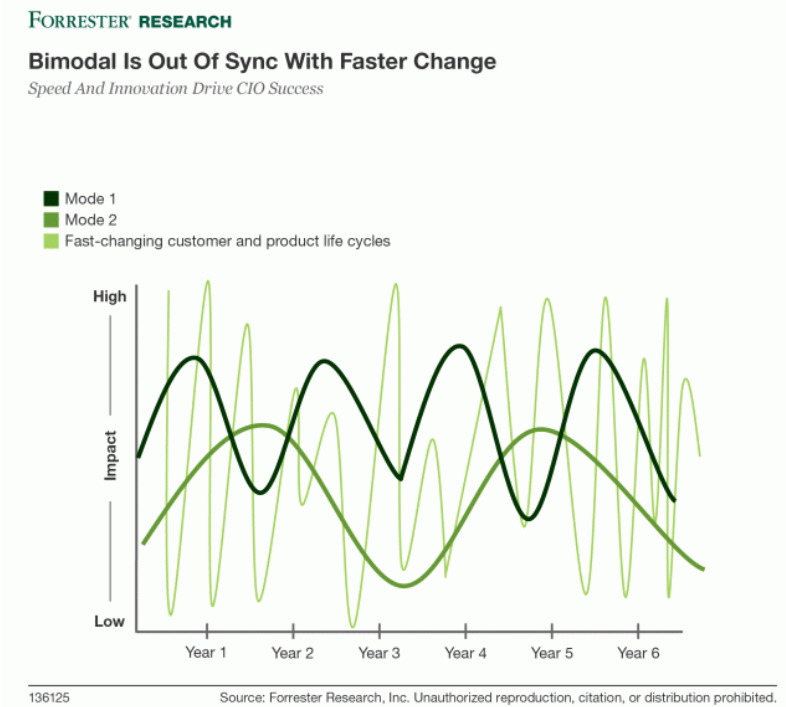 Fueled by changing customer demands CIOs are kicking bimodal to the curb. As are some analysts. CIOs are accelerating IT service delivery, pumping out minimally viable products, testing them, collecting feedback and refining them and or squashing them if they fail. Managing IT as a product -- getting products out the door as if they are being chased by nimble competitors -- has emerged as a popular construct. Perhaps no CIO has a better grip on this than Schulze, who cut his teeth in product development working at Cisco Systems before transitioning to IT. This has given Schulze a healthy respect for shipping code and, ultimately, products. He embraces agile development and tries to "reduce the friction" between his department and his business partners. Speed is the prize. "If you’re the IT department and you’re not helping your product development team with time to market you’ve lost," Schulze says. "They’re going to go off and do it themselves. Very talented people are trying to get something innovative out to market. Let them innovate." Since becoming Micron’s first CIO in 2015, Schulze has built machine learning solutions that create new insights into product availability, demand forecasts, and improved the way raw materials are calculated. He says data scientists and IT engineers partnered closely with the business to make this happen. At Sysco Systems, CTO Wayne Shurts has reorganized his IT organization from order takers in individual systems groups to teams that support product development through agile and DevOps. Sysco, a leading food distributor, is putting the customer at the center of the product development process. Shurts says Sysco would fall behind if it continued building software in the waterfall method. “I don’t believe in the bimodal crap either," he says. "The whole thing is about responding to the marketplace and the demands for our customers and I just believe [agile and DevOps] is a better mousetrap for how to do software... we’re going agile everywhere." Working from the customer backward is just as important for cloud software vendors, for whom tweaking and shipping code is a constant. As the CIO of Workday, Diana McKenzie shepherds a program to vet SaaS human resource and financial applications created by product development teams. She says IT is the "first and best customer of our products" before they are released commercially. "IT needs to set itself up to look like the customer and reflect the organizations we're selling into," McKenzie says. Most recently, McKenzie tackled the challenge of generating analytics to help customers gain better insights into their Workday deployments. The CIOs say there were some bumps along the way, but nothing unexpected, while trying to cajole IT workers to unlearn years of learned processes. Management buy-in is also essential for success. "We have people who understand our business and secret sauce but they’ve been doing things a different way for 20 years," Shurts says. "They get excited about agile, they see that it’s better but then we do a pilot and it’s a lot harder than they think. They really want to do it but they have to unlearn habits learned over 20 years… The good news is we’re getting through that and we’re starting to see innovation and really good results." Schulze says people may need to be retooled because they were successful learning how to do IT in a certain way but success will ultimately hinge on having the right culture and mindset to facilitate change. "You can put in all the tools and methodologies and reorganize but if you’re leadership team doesn’t embrace this mindset of customer-centricity, and that time to market is critical... if you’re middle management isn’t on board, you’re stuck," Schulze says.